Aidan O'Brien spoke at length this morning about the talent at his disposal, including star Saxon Warrior, who heads the betting for the G1 Investec Derby, Britain's greatest and richest race, on Saturday, June 2, during a media trip by Epsom Downs Racecourse and Investec to the iconic Ballydoyle stables in County Tipperary, Ireland. Unbeaten in four starts, Saxon Warrior returned to action this year with a decisive success in the first British Classic of the season, the QIPCO 2000 Guineas at Newmarket on May 5, providing the trainer with a ninth victory in the mile Classic and a first British Classic success for O'Brien's jockey son Donnacha. The three-year-old son of Deep Impact, a first British Classic winner for the Japanese-based stallion, followed up a striking maiden (1m) victory on debut at the Curragh in August last year, with wins in both the G2 Beresford Stakes (1m) at Naas in September and the G1 Racing Post Trophy (1m) at Doncaster in October. The imposing colt worked in front of O'Brien and media this morning, and despite a hair-raising moment when he nearly pulled off a shoe while being paraded in front of photographers, the master of Ballydoyle is delighted with his charge, with less than three weeks to go until the Investec Derby, which is worth at least £1.5 million. O'Brien has won the Investec Derby on six occasions courtesy of Galileo (2001), High Chaparral (2002), Camelot (2012), Ruler Of The World (2013), Australia (2014), and Wings Of Eagles (2017) and will become the joint winning-most trainer in the Classic's long history alongside Robert Robson, John Porter and Fred Darling, were he to succeed again this year. Britain and Ireland's champion Flat trainer revealed: "Saxon Warrior is in very good form at home and has come out of the 2000 Guineas very well. He is a good traveller and a very well-balanced colt. "He didn't have any problem with the dip at Newmarket and he wears his head low, so we'll see what happens at Epsom. "We were always looking forward to stepping him up in distance, but in the 2000 Guineas, he travelled like a miler and quickened like a miler. However, we have always thought he was going to be a middle distance horse - he is very good. "He got headed in the Racing Post Trophy and got headed again so you would have to be very happy with how everything panned out at Newmarket. "We were very happy with the 2000 Guineas as that was his first run of the season and he was going to progress from it. There is a nice gap between Newmarket and the Derby so usually if they can handle the dip at Newmarket like he did, then hopefully they should be able to handle the contours of Epsom. "Ryan Moore will ride Saxon Warrior in the Derby and is our number one rider. They (Moore and Donnacha O'Brien) went through the 2000 Guineas beforehand and discussed the race. There are so many variables in races that you cannot control, such as horses around you and position. Obviously, if we are lucky enough to get him to Epsom in good shape, hopefully the rest will fall into place." Camelot, also trained by O'Brien, was the latest of 37 horses to complete the Guineas-Derby double in 2012. He missed out on becoming the first Triple Crown winner since Nijinsky in 1970, trained by O'Brien's predecessor at Ballydoyle, Vincent O'Brien (no relation), when second to Godolphin's Encke in the St Leger at Doncaster. 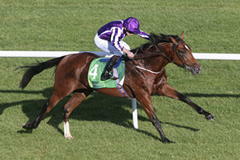 Saxon Warrior, who like Camelot runs in the colours of Derrick Smith, Sue Magnier and Michael Tabor and also inhabits the same box at Ballydoyle, could bid to emulate Nijinsky, with O'Brien intimating that connections are targeting a tilt at the Triple Crown, if all goes well in the Investec Derby on June 2. The trainer continued: "We viewed him as a Camelot and Australia (2014 Investec Derby winner) type of horse and that is the way we have done everything with him. "Donnacha rode him well and he really quickened up impressively (at Newmarket). Donnacha rode the horse work and knew him very well, so it was a special moment. 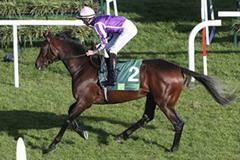 "Saxon Warrior has a very strong blend of Danehill, Galileo and Deep Impact in him. Those three strong traits make him a horse that we haven't had before so he is very different. "He is very strong and powerful. He is built like a miler, but we always thought he would stay. He went like a horse who would love going middle distances. You can see all of those strong traits in him, so he is very interesting. "I think the lads (the owners, plus Coolmore supremo John Magnier) would think long and hard about the Triple Crown. If the opportunity arose for that to happen, I think the lads would think about doing it. They won't think about it until after the Derby, but obviously it would be unbelievable to have a horse who was able to do it. "We would be delighted if he could win the Triple Crown. It is a tough thing to do to win those three races. We were delighted with Camelot, having won a 2000 Guineas and a Derby. We didn't win at Doncaster, but with all those things, we analyse what went wrong and if a horse did come along to put us in that position again, then we would be delighted. "Life is life and things happen for a reason, we don't understand sometimes why these things happen, but they are out of our control so we accept them and defeat gracefully and move on. "We were always hopeful after Camelot that perhaps another horse would come along who could run in all three races and that was part of the reason that Saxon Warrior started in the 2000 Guineas. We could have gone to the Dante with him, but we thought if there was a chance we had a Triple Crown horse, he was going to be the horse, so that's why we started him off at Newmarket. The way it worked out, we were delighted so we are still alive and kicking after the first round. "It would be interesting to see if he would stay further after the Derby and targeting the Triple Crown and going for races like that is something that the lads have started to think a lot more about, such as if a fast horse comes along which they don't think will stay, then they won't go that way. "The lads have changed a lot since we came here. The commercial notion is not as important anymore as exposing the horses. They have a big broodmare band and a big team of stallions so they are exposing horses to different races to see what their limitations are." 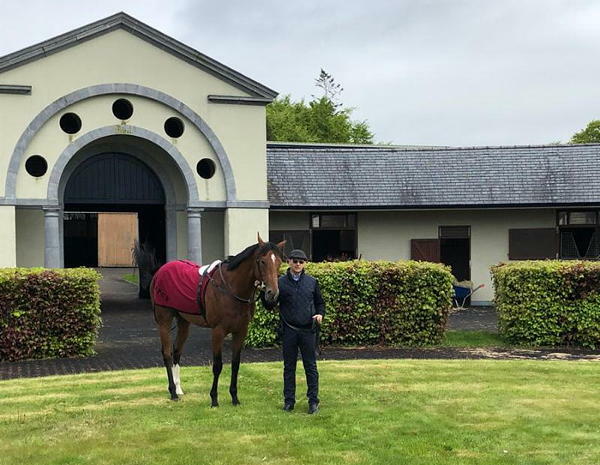 O'Brien looks set to have a number of other runners in the Investec Derby, including Delano Roosevelt (18/1 with Unibet) and The Pentagon (20/1), who finished second and third respectively behind the Dermot Weld-trained Hazapour in the Derrinstown Stud Derby Trial at Leopardstown over 10 furlongs on May 13. "I was very happy with our horses at Leopardstown yesterday. It wasn't a mad pace by any stretch of the imagination, but sometimes the trials can nearly turn into the real races themselves so horses don't progress like you feel they will do going into the big races after a trial. "However, yesterday they went very slow and it was sensible. Looking at our horses, I thought maybe a mile and a half might suit them. "We will have more than one runner in the Derby and we will try to ensure that it is a fair pace for everybody as you never really work out what stays if you go a slow gallop. All you can ever ask for in the Derby is that the horses come out of the race well and then we decide where to go next with them. "Hopefully, we get a clear run from now. I haven't spoken to the lads about the other horses we may run in the Investec Derby yet and they won't make a decision yet, but I suppose Delano Roosevelt and The Pentagon, who finished second and third at Leopardstown yesterday, could go." Discussing the undulations and idiosyncracies of the mile and a half Derby course at Epsom Downs, O'Brien observed: "Saxon Warrior has been around our Tattenham Corner at home probably 40 times. "He hasn't been on the grass at home yet as a three-year-old because of the wet weather, but, with Dr Vincent O'Brien, everything was geared towards Epsom - it was the most important race in the world, so everything is Epsom, Epsom, Epsom. "Saxon Warrior has cantered around there loads and it is part of the routine. There is an Epsom gallop and an Ascot gallop, with the Epsom gallop being a mile and six furlongs." Kew Gardens (25/1), three and a quarter-lengths second to Harry Dunlop's Knight To Behold in the Betfred Lingfield Derby Trial at Lingfield Park on May 12, is another intended Investec Derby runner for the Ballydoyle trainer. "We were very happy with Kew Gardens at Lingfield", said O'Brien. "The winner was very keen and it's very rare that you see horses who are like that stay on and actually win. I wouldn't put you off of Kew Gardens though, he could be a proper mile and a half horse. That's four horses there and we'll have to wait and see if something else runs." O'Brien could also be represented in the premier Classic by James Cook and Zabriskie. The pair finished fourth and sixth respectively in the Listed Investec Blue Riband Trial at the Investec Spring Meeting at Epsom Downs on April 25 and both horses are set to run on Thursday, May 17, in the G2 Betfred Dante Stakes, usually the most informative trial, over an extended 10 furlongs at York. He commented: "James Cook and Zabriskie will run in the Dante at York this week and we'll see how they get on. As we're in Ireland, we try and get our Derby horses out before York as we have to travel a lot more than anyone in England would have to. They could both go to Epsom depending on how they run, but if not we will hold some horses back for Royal Ascot. We have Saxon Warrior, but, at the same time, you need to have back-ups. "I think Rostropovich (Listed Homeserve Dee Stakes winner at Chester last week) might go for the French Derby. We went up in trip with him and he won well at Chester. Nice ground is probably ideal for him and in a way Chester is like Chantilly as it is sharp and tight. He's a very straightforward and relaxed horse who quickened up well at Chester." O'Brien also discussed the "tension" associated in the build-up to the Investec Derby: "The same tension and nervousness is still there ahead of the Derby. There is only one Derby and, every year, it brings with it new challenges with different horses - there are so many variables. "Our horses are progressing from their first run to their second run to their third run as we haven't been on the grass so far this year which is the first time I can remember. They are coming along slowly and we didn't want to force them early on as we want them to keep progressing. "Complacency is the one thing that will come and get you one day so we do our best every second of every day. It can be tough, but we do our best and we take everything as it comes. We analyse what happens, we accept it and then move forward. "We have a plan and we try and stick to that plan. It might change from race to race, but we have a clear goal about what we are trying to achieve as the people here put in a lot of time, work and investment, so it's great when we get results, but we don't take it for granted. We have three lots and we spread them out across the morning. They do a lot of walking and do everything slowly and gently." O'Brien will also be strongly represented in the Investec Oaks, the fillies' Classic, at Epsom on Friday, June 1, Investec Ladies' Day, with Magic Wand, an impressive three and a half-length winner of the Listed Cheshire Oaks at Chester on May 9, set to be joined by stable companion Forever Together, who was second to Magic Wand at Chester. The pair are priced at 14/1 and 16/1 respectively with Unibet and could be joined by Bye Bye Baby (12/1), successful in the G3 Blue Wind Stakes at Curragh on May 12 and Magical, who finished fourth on her seasonal debut in the G3 Prix de la Grotte at Longchamp on April 15. Clemmie and September will miss the Investec Oaks. O'Brien remarked: "As for the Oaks, I think Magic Wand and Forever Together, the two fillies from Chester, will both head to Epsom. We might go to the Irish 1000 Guineas with Happily and then perhaps something like the French Oaks as she is not guaranteed to get a mile and a half. "Magical didn't run yesterday [Derrinstown Stud 1000 Guineas Trial, Leopardstown] because of the ground so she may go straight to Epsom. This year there isn't a big gap between the Irish 1000 Guineas and the Oaks at Epsom, so we have to make a decision to go for one or the other. "September won't go to Epsom as she is just trotting currently. She is getting back to full fitness, but that is just the way it is. She's still not 100 per cent. "Clemmie will run in the Irish 1000 Guineas and if she runs a nice race there, then we will head to Ascot. Everything is good with her and there is improvement in her. Her canters are gentle and we can't have another setback with her. She was a little bit stiff behind, but we couldn't really find anything wrong with her as her x-rays and scans were all fine, but she wasn't 100 per cent trotting. She is fine now and she'll be another interesting one." O'Brien will also run either Idaho or Cliffs Of Moher in the G1 Investec Coronation Cup over a mile and a half at Epsom on Friday, June 1. The master of Ballydoyle has won the contest for older horses a record eight times, courtesy of Yeats (2005), Scorpion (2007), Soldier Of Fortune (2008), Fame And Glory (2010), St Nicholas Abbey (2011, 2012, 2013) and Highland Reel (2017), but has yet to decide which horse will head to the Surrey course. Idaho, Highland Reel's brother, was a comfortable winner of the G3 Ormonde Stakes at Chester on May 10 on his first run outside G1 company in eight starts and finished third in the 2016 Investec Derby behind the Dermot Weld-trained Harzand,. The five-year-old son of Galileo came home sixth in last year's Investec Coronation Cup. Cliffs Of Moher finished second to stable companion Wings Of Eagles in the 2017 Investec Derby and returned to winning ways in the G2 Mooresbridge Stakes at Naas on May 7. O'Brien said of the duo: "Idaho won well at Chester. The plan was to run at Chester in the Ormonde and then head to Epsom - that still is the plan. After Chester, Ryan said he could be a horse who would go further. Seamie, when he rode him in the St Leger, said he was going very easy, so it seems to make sense that he wants further. "Cliffs Of Moher could go for the Tattersalls Gold Cup or the Coronation Cup. His best run was in the Derby and we were very happy with him the last day. He is a good, strong traveller, but, speaking to Ryan yesterday, he said to not rule out the Coronation. We have to decide that as well, so it will be interesting. I'd imagine one of Cliffs Of Moher or Idaho would run in the Coronation." The Ballydoyle handler also reflected on the remarkable stallion career of Galileo as well as the burgeoning impact of Deep Impact, for whom Saxon Warrior was a first British Classic winner for the Japanese-based stallion. Galileo has been responsible for three Investec Derby victors - New Approach (2008), Ruler Of The World (2013) and Australia (2014). The trainer explained: "Galileo has been the most incredible stallion of all and all of his horses seem to have real courage about them. Deep Impact could be massive and is very exciting. We had three horses from Deep Impact last year (September, Saxon Warrior and Conclusion) and the world is a small place now so he will continue to be important to us." O'Brien also discussed his methods of training: "It's important that we get results for everybody and we just try to survive each day as it comes. I go to bed in the evening and hope I wake up the next morning. "I start at 5am in the morning and I'm in the barn by 7.30. I then do the lots till lunchtime and after lunch then go round the yards before my tea at 6pm. Then I'll go back round the yards before heading to bed at 10pm. "If I am travelling, I try and sleep whilst we are travelling as one of the most important things you need is sleep. I have found that without rest, you will be broken up emotionally and physically because there is an awful lot of stuff going on every day, so you have to be as clear as you can and sleep is important for that. "I take everything one day at a time and don't take anything for granted. Circumstances change things for everyone in the end, but we'll keep doing our best until we have any changes. You have to balance everything and it's good to have people around to help balance the situation. This time of the year is intense as there is a lot going on and you try to give the best information you can to the important people. "The stables here are divided up into colts and fillies. We then separate the best colts, the second-best colts and the third-best colts. They can't all be in one yard so we have to separate them up and the top colts are in the Giant's Causeway yard, so that is the way it is. "When we go away to America, Ballydoyle is emptied and washed out and painted for a new year. There is then a pecking order which the lads decide as to what horse ends up in one yard. "A lot of thought goes into all of this and wherever the horse lands, they stay there for the year. Wings Of Eagles was in the B yard last year! "We have around 190 people who work here and about 70 riders who are all involved in the important decisions. To win one Group One is difficult, so to break the record last year was very special (O'Brien achieved new world record of 28 G1s)." Unibet spokesman Ed Nicholson said: "Saxon Warrior is very solid in the Investec Derby betting market. A couple of the Aidan O'Brien horses disappointed yesterday, but it looks like he expects both Delano Roosevelt and The Pentagon to improve, because they haven't been able to train on turf. "A lot of trials have come and gone and there are a couple of contenders being talked about, but Saxon Warrior has firmed up in the betting whilst sitting in his box. "Hazapour did it nicely at Leopardstown yesterday and Dermot Weld seems very confident that he will handle the undulations of Epsom and he is also related to Harzand (2016 Investec Derby winner). We saw some market support after that race as we made him 20/1 originally, before he was backed into 16/1. "I think that is something we are seeing now that some horses are being backed each-way as opposition to Saxon Warrior, with punters trying to find some value."